“As we seek to build a new, inclusive South Africa, we look to the energy and creativity of the youth. Young people have been at the centre of every decisive historical moment in the struggle against colonialism and Apartheid. Young people are catalysts for social change,” said President Ramaphosa at his Youth Day celebration address at Orlando Stadium. “From the founders of the ANC Youth League in 1944 to the students who led the 1976 uprising, to the Young Lions of the 1980s, it is the youth of our country who hastened the demise of Apartheid. Even as we built a democratic South Africa, it was the fearless young people who reminded us that liberation would not be complete until the wealth of the land is shared among its people. The current generation of youth has, therefore, chosen as its mission, the attainment of economic freedom,” he said. President Ramaphosa stated that the youth continue to bear the brunt of unemployment, poverty and inequality, and remain the hardest hit by disease, violent crime, drug abuse and underdevelopment. “We understand the frustration of young people who cannot find jobs, who do not have the skills and experience employers are looking for, and are unable to find the support they need to start their own businesses. Our shared responsibility, as the government, business, labour and civil society, is to develop pathways into work for the young people. It is this task to which we should be directing all our efforts and all our energies,” said Ramaphosa. Progress has been made in many areas to remedy these challenges. The National Youth Development Agency has established a value chain of entrepreneurship, which includes skills development training, development finance, mentorship, support and market linkages. More than 2 500 startup companies have been provided with funding, creating more than 10 000 jobs in the economy. Beyond this, more than 25 000 young people have been placed in job opportunities over the past three financial years. “The government has done much through its public employment programmes and investment in infrastructure to give priority to young people and women. It introduced the Employment Tax Incentive to encourage companies to employ more young people. “The government, business, labour and civil society have begun preparations for a jobs summit, which will need to take extraordinary measures to create jobs on a scale that we have never before seen in this country. “It will need to forge a new social compact, which mobilises all sections of society behind the task of growth and job creation. We have demonstrated what is possible through working together,” said Ramaphosa. The Youth Employment Service, which is an initiative led by the private sector and supported by the government and labour, was launched earlier this year to bridge the gap between school and work. With a number of large companies already involved, it aims to create a million work experience opportunities for young people over the next three years. As part of this initiative, small businesses and micro-enterprises run by young people will receive assistance through wage sponsorship and through business literacy and entrepreneurial training. “The challenge for the unemployed youth is not only one of skills. There are many graduates, who have completed university degrees, who are still unemployed. This is a vast pool of skills and knowledge that is being wasted. 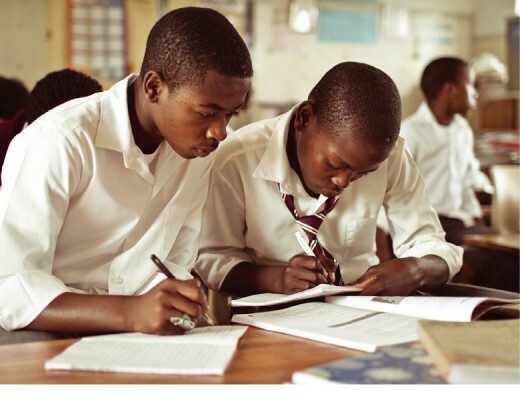 Society has invested a great deal in the education of these young people, but our economy is not benefiting from this investment,” said Ramaphosa. He called on all companies—both in the public and private sector—to make a deliberate effort to seek out unemployed graduates and employ them, reasoning that it does not place a great burden on individual companies but if taken up on a large scale, such a call could significantly reduce youth unemployment, while bringing much-needed skills and capacity into the economy. “Employers need to understand that for our country to succeed, for their businesses to thrive, they must take responsibility for providing young people with the work experience they need and realise that the only way to get work experience is to get work. If we are to succeed in creating more jobs for young people, our economy needs to grow much faster—and for that, it needs investment,” Ramaphosa said. The government has embarked on a massive investment drive that aims to attract US$100 billion into our economy over the next five years, focusing on investment into those parts of the economy that have the greatest potential for growth and the creation of jobs for all, and investment that will create opportunities for young people in particular. President Ramaphosa emphasised that if we are to make effective use of this investment, young South Africans need to be equipped to participate in the Fourth Industrial Revolution. It is for this reason that the government is investing so significantly in education and is making great progress in ensuring that no child, regardless of their circumstance, is denied access to education. “Despite significant challenges, we are continuously working to improve the quality of teaching and learning in our schools; progress that is reflected in the consistent improvement in the matric pass rate. We are working both to improve the quality of education and the environment in which learning and teaching take place. “We look to the youth to continue to be at the forefront of the struggle for a non-sexist society. The empowerment of women, especially young women, must be one of our central tasks as we seek to build an inclusive society. We must ensure that young women have the same educational opportunities as their male counterparts, that they are equally able to compete for jobs and that they receive equal pay for equal work,” said Ramaphosa. “Young men and young women need to work together to put an end to all forms of violence against women, especially the devastating scourge of femicide. The recent spate of murders of young women by young men is deeply disturbing and requires that, as a nation and as individuals, we take decisive action to end such crimes,” he added. President Ramaphosa believes that this generation of young South Africans has an opportunity to fundamentally change gender relations and to achieve full and meaningful equality between men and women in all spheres of life. The challenges that our youth face are great, but they are not insurmountable and can be overcome if we work together and if the youth take the lead and become agents of their own liberation. Young people must be preoccupied with activities that contribute to making South Africa a better and safer country for all to live in. “As we celebrate Youth Day in 2018, we recall the lives of two outstanding founders of the youth movement in our country, Tata Nelson Mandela and Mama Albertina Sisulu, whose centenaries we are marking this year. These two giants embodied the values and the qualities from which we should all draw inspiration. Tata Madiba and Mama Sisulu were always ready to serve as volunteers for the greater good of our people without any motive of personal gain. “They sacrificed their own interests to fight for the freedom of others. The best way we can honour their sacrifices is to follow their example. We must shun selfishness and strive for collective prosperity. We must fight for the rights of others as much as we fight for our own,” said Ramaphosa. He proclaimed that we cannot stand idly by while the rights of others are violated, while there are people in the world who are still colonised, oppressed and exploited, and we cannot rest while there are still millions of people who go hungry, who do not have shelter and who do not have work. “We all have a responsibility, each and every one of us, to do everything in our power to make the lives of others better. The spirit of Tata Mandela and Mama Sisulu lives on in the young people of this country. It lives on in their dreams, in their determination, in their struggle for a better life. It lives on in their desire to be part of building a new nation of equality, prosperity and progress. It lives on in their willingness to lend a hand, to be ever-ready to say: ‘Thuma Mina. Send Me’. If we all do our part, we will all succeed,” he concluded. The president’s address reinforced the objectives of the NDP, whose vision remains consistent with that of the National Youth Development Policy Framework of achieving “integrated, holistic and sustainable youth development, conscious of the historical imbalances and current imbalances and current realities, to build a non-sexist, non-racist, democratic South Africa in which young people and their organisations not only enjoy and contribute to their full potential in the social, economic and political spheres of life but also recognise and develop their responsibilities to build a better life for all”. The goal of the NYP 2020 is to consolidate youth initiatives that enhance the capabilities of young people to transform the economy and society. This will be achieved by addressing their needs; promoting positive outcomes, opportunities, choices and relationships; and providing the support necessary to develop all young people, particularly those outside the social, political and economic mainstream. This policy emphasises the need for various youth development efforts and interventions that holistically respond to all aspects or spheres of young people’s lives.